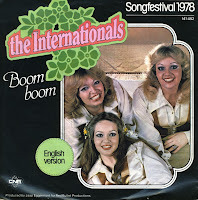 In 1978, the national final for the Eurovision Song Contest in the Netherlands took place on February 22. Eight songs were selected to be sung by Barry Duncan, Harmony, The Internationals and Kimm. The jury consisted of old Dutch Eurovision Song Contest competitors. While Harmony was selected with their song ''t Is OK', the Internationals recorded one of their two songs as a single. It was released shortly after the national final - but it didn't chart.